Some carriers ask you to arrive early to the station before departure in order to check-in and to guarantee happy boarding. What is the check-in and boarding process? Rail operators sometimes differentiate between check-in and boarding. Check-in: your ticket is checked by personnel and you pass through customs (for Eurostar). Boarding: this happens is a little later, when you actually board the train. Check-in for Eurostar closes strictly 30 minutes before departure. You must be present at the station at least 45 minutes before departure in order to complete the check-in process and pass through customs smoothly. Check-in usually opens between 1-1.5 hours before departure. We indicate the time that boarding begins on the website and apps. 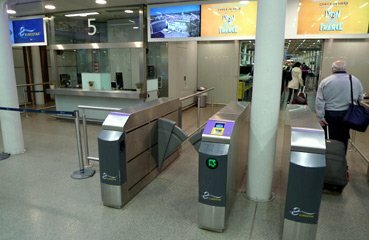 If you arrive less than 30 minutes before departure, you may be denied access to the train: your ticket will not be validated by the electronic entry gates. Please do not risk being late! If (and only if) you hold a Eurostar card or a Business Premier Flexi ticket, this time is reduced to 10 minutes before departure. Eurostar recommends you arrive 60 minutes before departure if it's the weekend or a holiday (peak hour times). The boarding of OUIGO trains opens 30 minutes before departure and closes 5 minutes before departure. OUIGO advises you to be there 30 minutes before the departure of your train. Tickets are checked on the platform as you board. For all of these trains, access to the train is no longer guaranteed 2 minutes before departure. If your train leaves at 7:00 a.m. and you arrive at 6:58 a.m., you may be refused access. In specific cases, SNCF carries out ticket checks on the platform which requires a little more time. If this is the case for your train, you will be informed.